Chinese internet stocks are way way way out of my comfort zone. Besides the hype and transient nature of many business models, the stratospheric valuations and the political risk are issues that I can’t get my head around. With the Chinese stock market up 25% in a month, it looks like classic bubble territory. Every now and again (as I did in this post) I look at how a few of the Chinese internet stocks that trade in the US are progressing for the sake of curiosity. 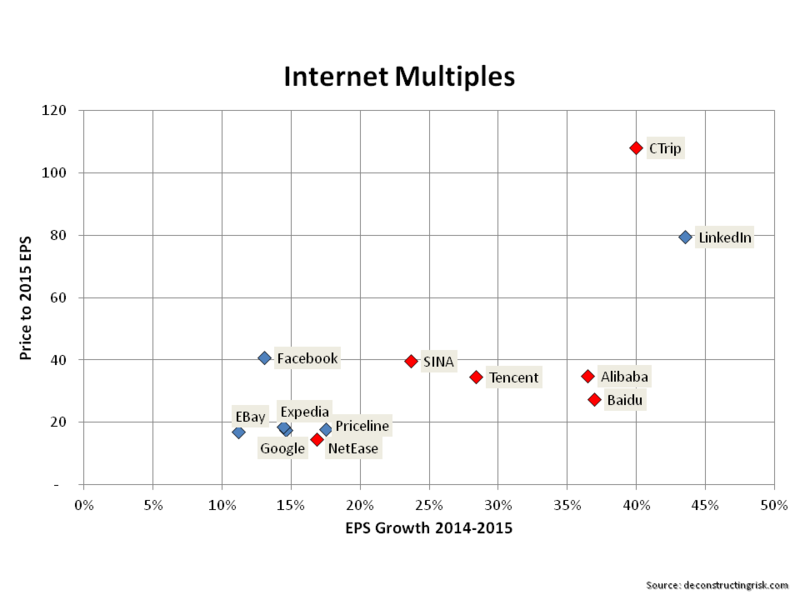 The graph below shows a selected few – Baidu (internet search), NetEase (online gaming), Ctrip (travel services), Sina (online media), Sohu (various online services), Tencent (social, traded in Hong Kong), and Alibaba (e-commerce). click to enlarge Tencent is the biggest gainer at over 300% since 2011; NetEase is just below 300%; with Baidu over 200%. Alibaba is up 16% since its stock market debut in September. Since 2011, the underperformers are Ctrip about breakeven, Sohu down 20%, and Sina down 50%. An equally weighted portfolio of these stocks, excluding Alibaba, invested at the beginning of 2011 would have resulted in an 84% gain or an approx 16.5% annual return. 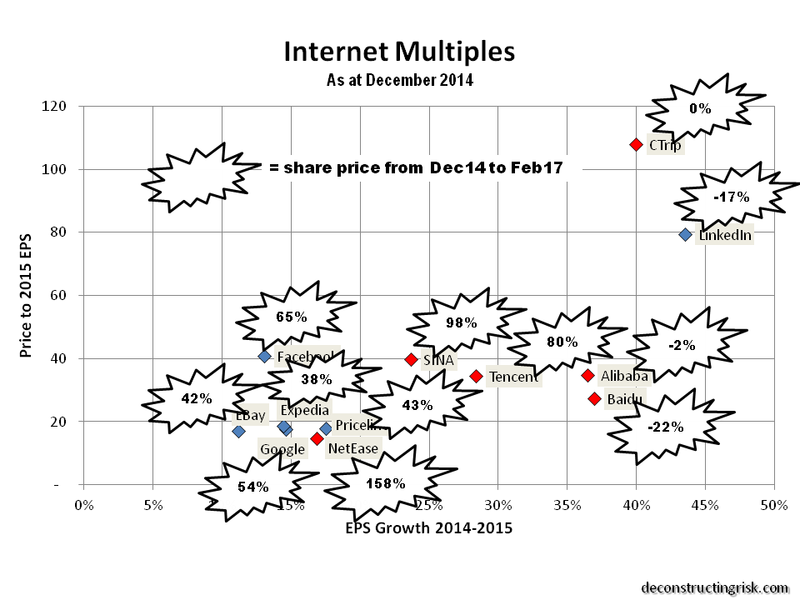 The current price to 2015 projected EPS multiples against the 2014 to 2015 projected EPS growth for these stocks compared to the same metric for a number of the established US internet names gives an insight into current valuations, as per the graph below. click to enlarge Looking at this graph, Baidu is the only Chinese stock of the names highlighted by IDC that looks to me like one that may warrant further investigation as an investment possibility (but only when there is a meaningful pull back in the market in 2015). 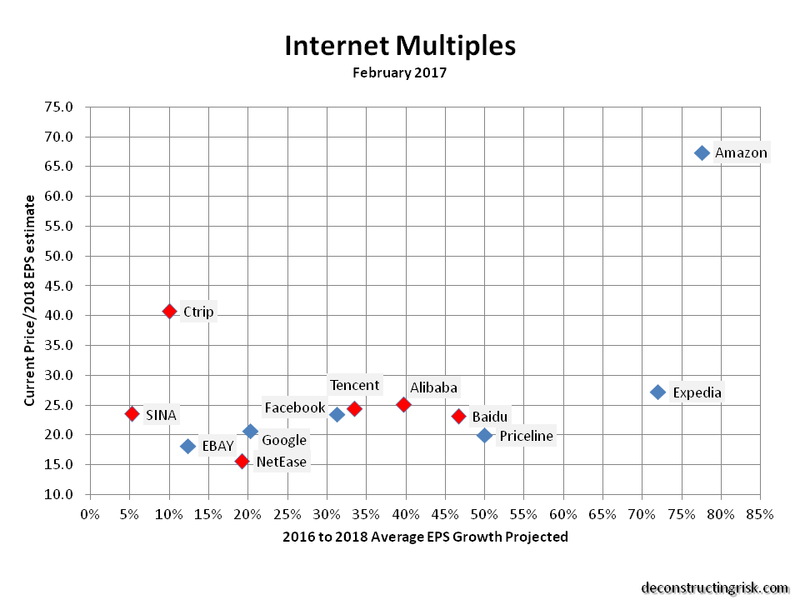 However, I wouldn’t be rushing out to get involved anytime soon as it seems to me that an established internet name like Google is more interesting as an investment prospect at current relative valuations than any of the higher growth Chinese equivalents. Chinese internet stocks on fire, again. Every experienced investor, like a jaded poker player, has stories akin to bad beat tales – great investments that got away. This post is not one of those tales. 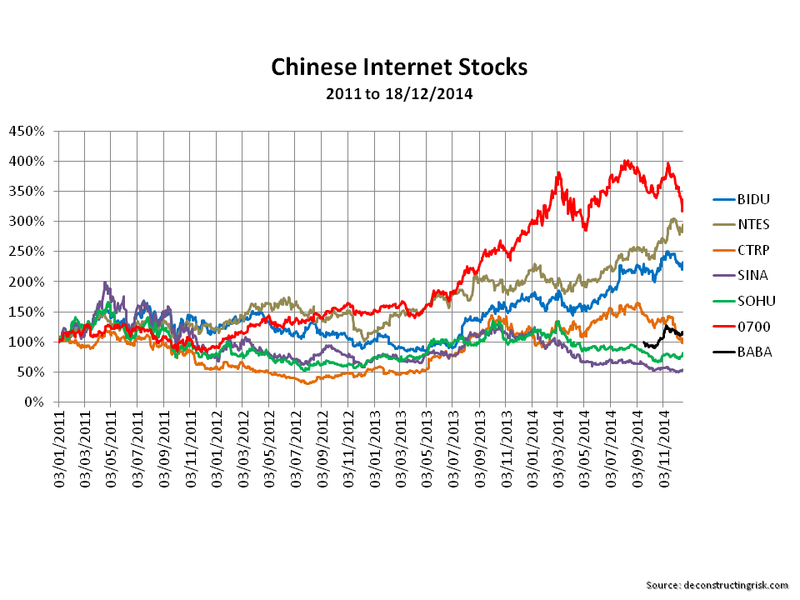 Seven odd years ago I did have a look at a few of the then hot Chinese internet shares – SINA and SOHU in particular. Both were growing solidly and were valued with big future growth assumed. Given the heated valuations and the lack of a credible history at that time, I passed. I was also uncomfortable with the political risk factor. It was therefore with interest that in recent months I noticed a few stories about stock increases in some familiar Chinese internet names. 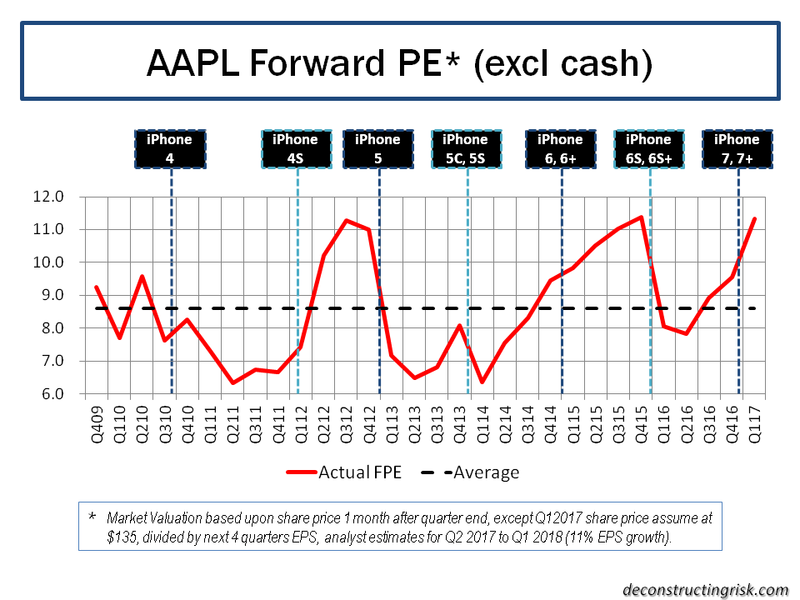 A quick look through the key statistics on Yahoo confirms that valuations remain aggressive with PEs based upon 2013 projected earnings in the 20 to 40 range across a sample of firms (albeit not as wild as in the past). Quarterly revenue, if not profit, growth also looks healthy at 20% to 30%. 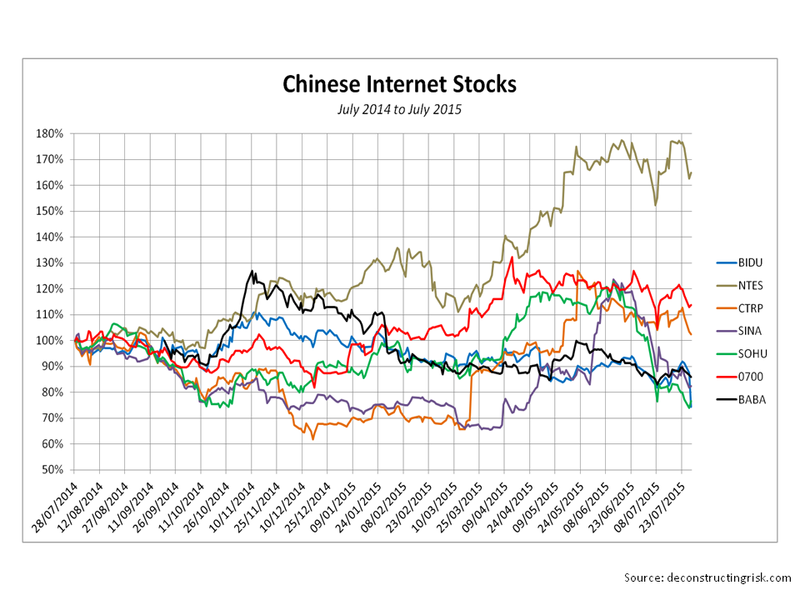 The graph below shows the share prices of some of the better known Chinese internet firms over the past seven years. Although I suspect my risk appetite will never be comfortable with valuations in this sector, at some stage, I’d like to dig deeper into the quality firms in this space to figure out if there is any appropriate risk/reward investment angle that I could live with (and at what entry level on valuation). 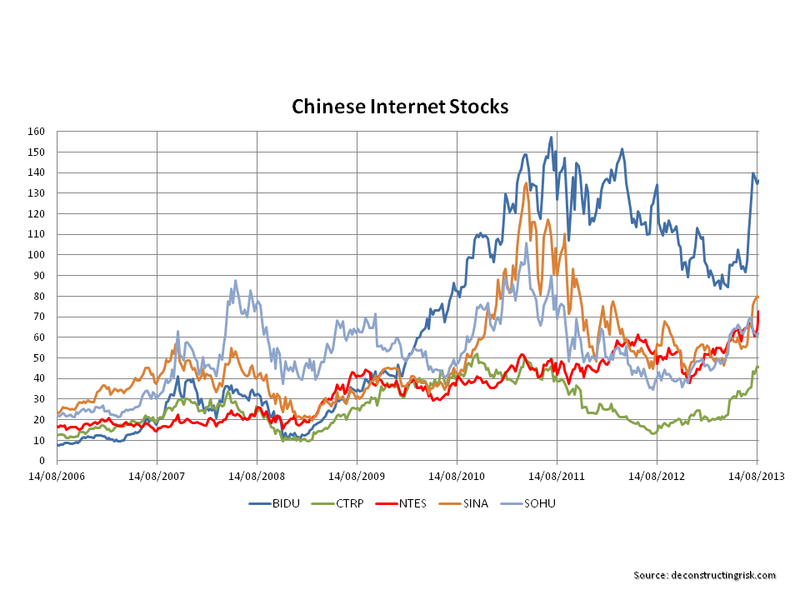 If nothing else, the rise and fall over 2011 to 2012 of SINA and SOHU looks intriguing (for old time’s sake! ).